Operating a jib from the rear. A jib is somewhat more complicated than a simple lever, since almost always the camera's aim needs to be controlled independently of the swing of the jib arm. This can be done by relatively simple mechanical means or by the use of remotely controlled electric servo motors. Since the camera operator is often not able to use the camera's controls directly or look through the camera's viewfinder, a jib is often used in conjunction with a remote camera control for focus and zoom and with a portable video monitor. A device known as a "hot head" or "remote head" is attached to the camera end of larger jibs. It supports the camera and enables remote pan/tilt functions with focus/zoom control. This setup can be operated by one person, or the circumstance may require two operators. In a two-operator situation, one person operates the jib arm/boom while another operates the pan/tilt/zoom functions of the remote head. ^ Zettl, Herbert (July 12, 2005). Television production handbook (9 ed.). Wadsworth Publishing. pp. 90–105. 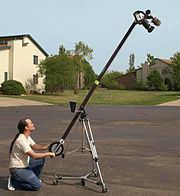 ^ Scott Schaefermeyer Digital Video Basics 1418865133 2012 p109 "A jib arm is basically a small crane that holds nothing but the camera. Large jib arms require somebody to move and control the jib while the camera operator controls the camera. " This film technology article is a stub. You can help Wikipedia by expanding it. This page was last edited on 14 September 2018, at 11:39 (UTC).